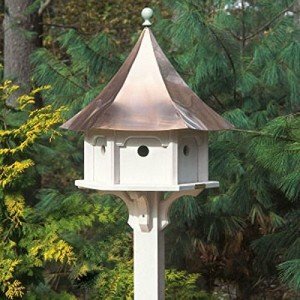 A copper roof birdhouse is a very nice looking addition to your yard decor. They might be a little higher priced but looks so much nicer and will last a lot longer. Most of them are hand painted bird houses and even hand crafted. One of the companies that are well known for their birdhouses with copper roofs is Good Directions. They are the makers of the Lazy hill farm copper roofed bird houses. All their products are made with a weather proof vinyl and in combination with the copper roof this bird house will last for many years. 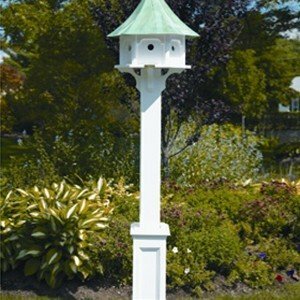 The owners of birdhouses with copper roofs often tell in reviews that this is the eye catcher in their yard and most of the time they make it the very first thing visitors see when they come to their houses. I have read many reviews that these copper roofed birdhouses have withstood the terrible winter of 2013 with no problem and even a foot of snow did not harm them. The things I would look for is if the roof can be easy removed for a clean down of the inside of the bird house. You can use it as a feeder or you can use it an actual bird house and hope the birds will build a nest in it. Both have the same need for quality and have to be weather proof. in the first situation of the bird feeder you want the seed to stay dry and clean. In the second situation of a bird house for birds to nest in you want the nest to be sheltered from the elements. The birdhouses, and this certainly goes for the ones with a copper roof, are available in many shapes and sizes. I have seen them as large as with 10 compartments. If this is a good idea for nesting I do not know. My knowledge of birds is to limited for that. I personally like the Amish made birdhouses with copper roof. To the best of my knowledge they are hand made and hand painted by Amish craftsmen. What always is an eye-catcher in my opinion is a good looking birdhouse with a copper roof on a pole or post. This picture is a nice example of it. Several times when I was driving I stopped for a minute to have a closer look at one of them. Many people who have one like to have a talk with you and tell you about the birds it attracts. For the people who like to make their own copper roofed bird house I have found video on how to do that. What I have noticed is that a lot of the people who have a birdhouse on a pole or post are trying to attracted purple martins. Purple martin birdhouse are very popular and many people would like to have them but got no idea where to start. Later I will write a new post on the subject of where to find purple martin bird houses for sale. If you enjoyed this post based on the subject copper roof birdhouse feel free to leave a comment or write about your experience.